Video is hands down the most impactful thing you can do on social media right now. Time and time again I’ll meet people in real life (yes – I go offline) and they already feel like they know me. VIDEO – it’s a powerful relationship-building tool for when you’re not there. Think about it: how could you really engage when you’re not there? What’s the best way to show someone what you’re like, how passionate you are, and how else could you build relationships en masse from afar in the way that video does? It’s the closest thing to actually being there, and it’s available to you right now. But… there’s a big problem with video… and that problem is you! Are worried what people will think. These are all perfectly normal feelings and I get them too. Each time I pick up my phone to record some video, I stop, think and work out what I’m going to say and then… my heart starts racing! My heart is beating so hard it’s coming out of my throat and the sweat starts to bubble up on my forehead, my hands gets clammy, and the butterflies in my stomach are dancing like they’re attending a rave! … And then I use all of that to nail my video with energy, passion and controlled excitement! It’s called adrenaline. It keeps you alive and it can help or hinder your videos. Adrenaline gets you ready to fight or fly. That’s why we have it. Adrenaline will give you the shakes and it’ll make you warmer than normal. It’ll speed up your speech. I know this and I’ve paid the price of it. Slow… down… take… a… deep… breath… and pause. Pausing is powerful when you talk. Pausing gives the viewer time to take in what you just said. Adrenaline will try to run all over your pauses and make you think a second is a minute. Practise your pauses. Really practise them. It’ll make you nervous. Adrenaline is designed to do this. It makes you edgy and panic-driven. If you were in a jungle this would probably save your life; in front of camera it just screws with your concentration. Deep breathing will really help here. I use mindfulness and breathing techniques before big talks, so you could try that. It might make you feel sick. Seriously, it can. Take some water, take some time, give yourself some slack. It’ll all be fine. It’ll warm you up! Adrenaline is a chemical to make your muscles move quicker. It’ll add some temperature to you. Try to stay calm, collected and if you really suffer with heat like I do, get a battery-powered fan to hold in between videos. Take a deep breath – in fact take three – before you go live. Take a few seconds to compose yourself and get ready to record or stream. My biggest tip for dealing with adrenaline is to think. If you’re really reading this now, you’ll be getting nervous. I am. We both have the ability to make adrenaline move around our body purely by thinking about a situation where we might think we need it. But you can reverse it. You can visualise the video going really well. You can think about what will happen when you post it, all the great things people will say, and all the great things that will happen when your content affects the days and the moments of your viewers. You’re about to put something amazing out into the world – be brave and be proud! I was talking to my 11-year-old son this week about his football skills. He was working on his goalkeeping. I said that the reason Petr Cech was so good in goal for Arsenal is that he practises and that so many of his skills have actually become an instinct. When we’re born, we have instincts to eat and cry and a few others… but we build on the rest. Practising stuff hardwires the skills into our superfast-processing brains so we don’t action the skill – it just happens! By playing in goal every day and getting some time in between the posts, Petr Cech has become a superfast keeper who launches his 6’ 4” frame at the ball with almost superhuman speed. Practice + hardwired instinct = adrenaline-fuelled skills. To get really good at video you need practice. You need to have this instinct to really know what to do when someone comments on Live video, you really need to have seen loads of your own videos to realise you need to pause, and you do need practice to control that fast-paced adrenaline-driven voice of yours so it all becomes an instinct. Just get your phone out, press record, then watch it back. You’re the biggest critic of you and you have a phone. So… you have it all! Stop recording and watch it back. How was it? Can you understand yourself? Are you speaking slowly enough? Did you wrap it up OK? Are you remembering to breathe and pause? Now do it again with your improvements… and again… and again. Remember that Petr Cech wouldn’t be so fast and so hardwired if he didn’t spend time in the goal, so you have to spend time in front of the lens. It’s just you… no one will see these videos unless you publish them, remember. Something I’ve worked really hard on is pausing. It can feel like an age when you pause on video or in a talk, but you must. A pause will help your viewer or listener take in what you just said. It can be as little as three or four seconds, but it’s a powerful skill to have. It will feel weird at first and it will feel like a very long time. Just a few seconds becomes an age with that adrenaline flowing, remember!? Take a moment between each point or section. Give your content the space it needs to have an impact. When you’re unsure what to say, say nothing. Don’t be tempted to add in loads of “ums” and “ers” to fill the space… leave some pauses while you think. It’ll make you look more accomplished and give your audience time to take in what you just said. It also shows that you really want to use the right words and that you’re not flustered at all. Many think that saying nothing is hard, and it probably is at first, but it’s better than umming and erring to fill the space. Make your point without adding in pointless sounds. You’re just scared of the silence… practice will help with that! Several times now I’ve been accused of being famous thanks to the video content I put out there. It’s really powerful if you’re brave enough to use it. But please have a point! To many videos are simply forgettable and total drivel. I did a short a punchy video this week on Facebook Live (as it’ll gain more reach) and it went down rather well. I’ve had some great comments on the main post and on shares thereafter too. I even had a phone call from someone I’ve never met before. Powerful, huh? Get that phone out and put on your big boy/girl pants. 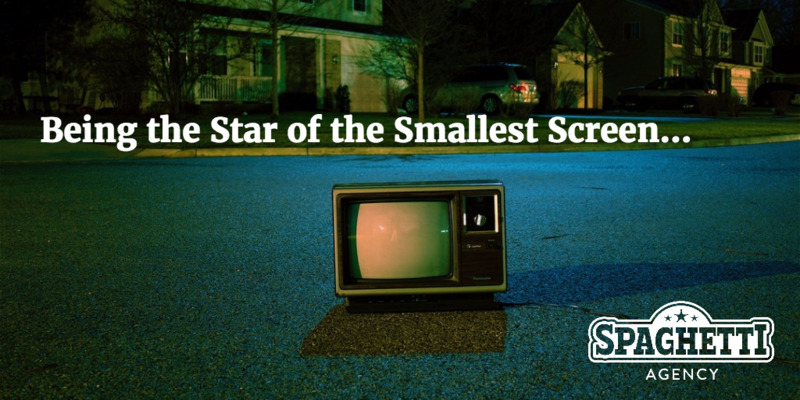 It’s time to get over yourself and become a star of the smallest screen!